The countries of the West used Israel to evacuate members of the White Helmets from southern Syria. They couldn’t be allowed to fall into the hands of the Syrian government — at least, not while they are still alive. Damascus is almost finished liberating southwestern Syria. The military’s Operation Basalt was extremely successful, allowing them to regain control of the occupied provinces of Quneitra and Daraa (at present the Syrian army has only a small chunk of land left to liberate from the jihadists). Many of the local gangs simply surrendered. 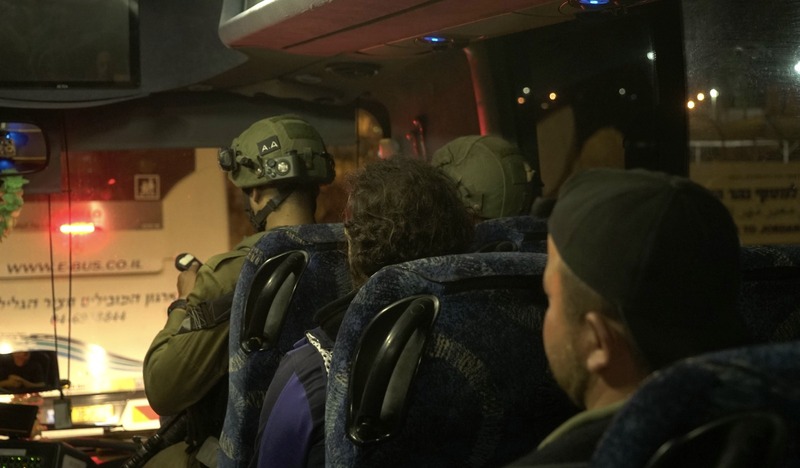 Those militants who wanted to remain underwent a procedure of reconciliation with the authorities, while the others were put onto green buses and sent to Idlib. However, those militants included some very valuable specimens — members of the “Syrian civil defense”, or, as they are more simply known, “the ​​White Helmets.” If they were taken prisoner, that would be a serious problem for the US and its allies, since the members of that organization might have a lot to say once they were in front of the cameras. And the damage caused by their statements would be far worse than the fallout over the admissions made by Hassan Diab — the boy the “helmets” named as a victim of a chemical attack in Douma, who admitted that the attack had been staged for the photographers. And it would be so much worse, simply because the White Helmets — or at least their leaders — knew so much more. 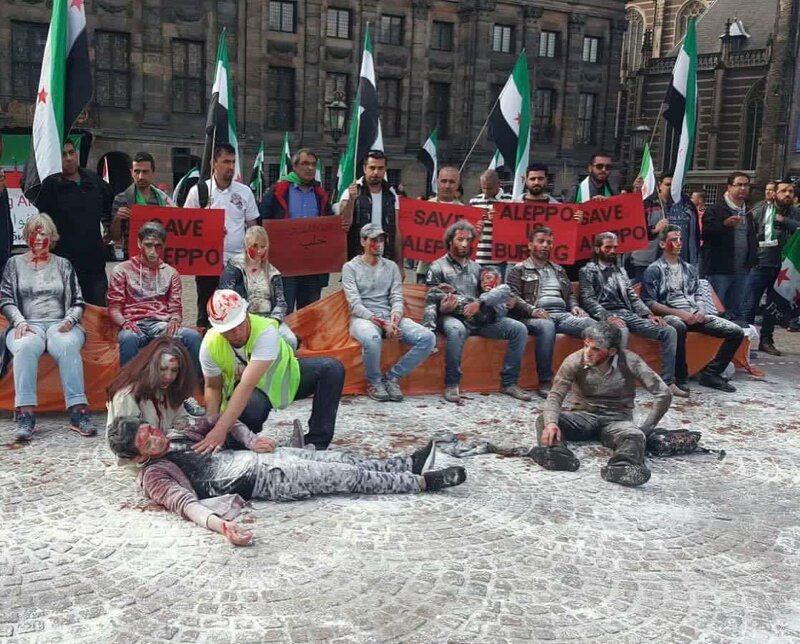 This is not Aleppo, Syria, but rather the streets of Europe where a “save Aleppo” protest was staged. Actors posing in fake dust and blood proved just how easy it is for anyone to create “war victims” anytime, anywhere. The White Helmets have been the West’s most important weapon on the propaganda front of the Syrian war. They have acted as the local human-rights activists who have been snapping photos and shooting videos about the “chemical attacks” that that “bloody tyrant” has carried out against his own people. And based on precisely these facts, the US and its partners imposed sanctions against Damascus and have carried out acts of revenge in the form of attacks that would have been nothing less than carpet bombing, had Moscow not been careful to issue stern warnings about the consequences of these attacks. 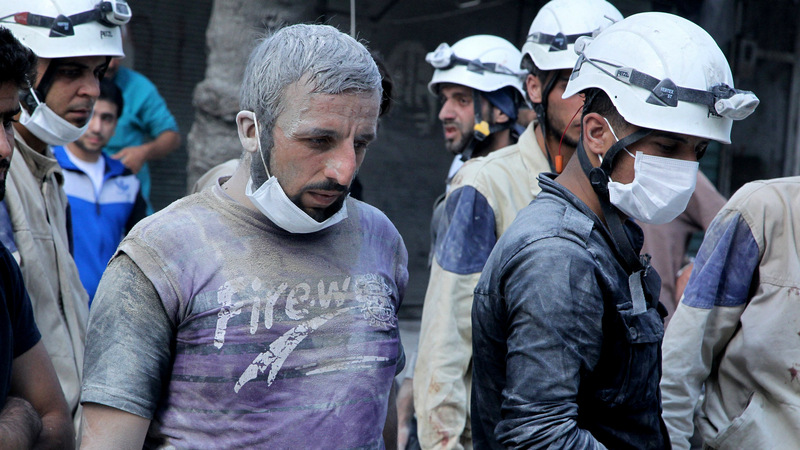 The Syrian authorities, as well as Moscow, Tehran, and anyone else who gives it a minute’s thought, have naturally cautioned that this data is unreliable and that the White Helmets are, in fact, a PR service for terrorists, whose members chop off their captives’ heads once they take off those helmets, just as their un-helmeted counterparts do. And in order to rein in any growing doubts, the West began to create an image for the White Helmets as heroes without fear and above reproach — as fighters for human rights, who rescue ordinary Syrians from the rubble that was created when Assad’s troops bombed peaceful villages According to the official legend, the White Helmets have saved a total of 80,00 lives since 2012 -and some of them right in front of the cameras, after which the “seriously wounded” then stood up and ran somewhere else so they could be heroically saved again. A movie about them even won an Oscar. This means that no decent, upright person (including experts from the OPCW) should harbor any doubts that those pictures — taken from mobile phones somewhere or other, filming something or other — delivered to them by the White Helmets are anything other than real evidence of chemical attacks by Assad. Over time, relations between Americans and the Helmets have deteriorated — in part because the new White House administration understood the futility of the Syrian front in the battle against Iran and did not want to get entangled in it. Fulfilling the orders of those who were, in contrast, interested in sucking the US further in, the Helmets staged more and more fake stories, trying to drag Trump into the war, which was the only chance the anti-Assad resistance had for victory. It was no surprise that the United States first stopped funding the organization, and then, when the progressive-minded public was outraged by this infringement of the rights of the heroes of the fight against that bloody tyrant, Washington agreed to allocate several million dollars anyway, so that the “heroes” could keep working until the end of the year. However, Washington was not ready to leave them in the lurch — those people know too much, and must not end up in Bashar al-Assad’s hands. And this is exactly why the West decided to pull the White Helmets out of southwestern Syria anyway. And they had to be pulled out as quickly as possible — the Syrians had taken control of the Jordanian border, and the “PR reps” were trapped on a small strip of land along the Golan Heights. And according to Benjamin Netanyahu, it was faced with this situation that US President Donald Trump and Canadian Prime Minister Justin Trudeau asked him to arrange the evacuation of the White Helmets and their family members, since “the people who saved lives were now under life-threatening danger.” The Israelis first brought them into their own country, before turning them over to the Jordanians. A total of 422 people (the White Helmets and the members of their families) were pulled out, according to official figures. Now they are being held in a secret shelter inside Jordan, and in three months they will be resettled in Britain, Canada, and Germany. Far from the cameras. And since the data on their subsequent whereabouts will be strictly classified, no one will be able to stop the West from quietly killing off the most important and most dangerous of them. Just to be on the safe side. This well written delightful contrivance of comedy exposes evil far more honestly than does the earnestness of tragedy; of opposition. So, all here, do have some popcorn. The USA, Israel, collectively known as The West. are due after Interval.